This was the view out of the window when I wandered, bleary eyed, into the kitchen this morning. 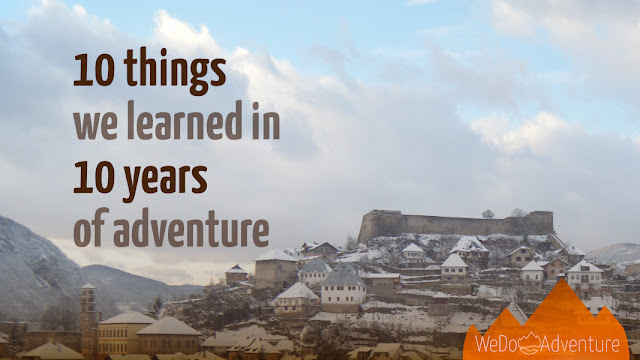 Yesterday we had been told there was snow up in the villages above Jajce. There was speculation as to whether we'd get the same weather in the town. We didn't, but,as you can see, the high ground got quite a good dusting overnight. Today we were back in Banja Luka buying things we need to get Novi Most up and running in Jajce. Most of the way there was snow somewhere to be seen. The mix of fine fall (or autumn) colours and a dash of winter wonderland made for another very scenic drive. This time the overtaking entertainment was provided by a reckless coach driver who was powering down our side of a section of single-carriageway road as we rounded a corner. The benefit-of-the-doubt assessment would be he'd misjudged the speed of the double-length lumber truck he was struggling to pass. More likely, he was just to impatient for his own good. I halved my speed, deciding not to get unduly excited: no horn! As he squeezed back over to the right he flashed his lights in what I hope was an admission he had been in the wrong. Sadly, too many coach drivers we see appear to have a very cavalier attitude to their passengers' safety.